I’ve been imagining this triple digit heat without air conditioning. Where would I go for comfort? Our ancestors didn’t have the convenience of HVAC units, so they sought the dark, moist enclosures of caves. They parked their chairs at the mouths of caves and plucked guitar strings, gossiped, brought out their checkers and playing cards. Over the past few years, I’ve toured several caves, learning about their differences and enjoying the experience of caving with friends and family members. I like watching the different ways that people respond to being in a cave. Some people feel claustrophobic, others want to sneak away from the group and explore on their own, many joke to ease their fears, and one or two imagine all the previous lives to pass through the earth’s corridors. “And you want to go back inside?” I asked. In one of the caves I toured, couples can have their wedding ceremony. The wet, limestone trail unevenly dips further into the earth’s interior. I consider a 21st-century bride in popular stilettos wobbling around the winding passage toward the groom. She could wear a headlamp instead of a veil. That might be a great scene for a novel. In my novel Multiple Exposure, a cave is one of the strongest parts of the setting, but no one gets married in it for this book. I wrote about other faces of the cave–how inviting it can be, offering cool air during the heat; how frightening it can become in the darkness; how secretly it holds mysteries; how inspiring the process of discovery becomes when people explore the underground regions of the earth. With 109 degrees pushing Middle Tennessee thermometers to extremes, caves offer a comforting embrace. Afterall, they are carving out spaces with a constancy that we forget while we scurry around up here, under the sun. 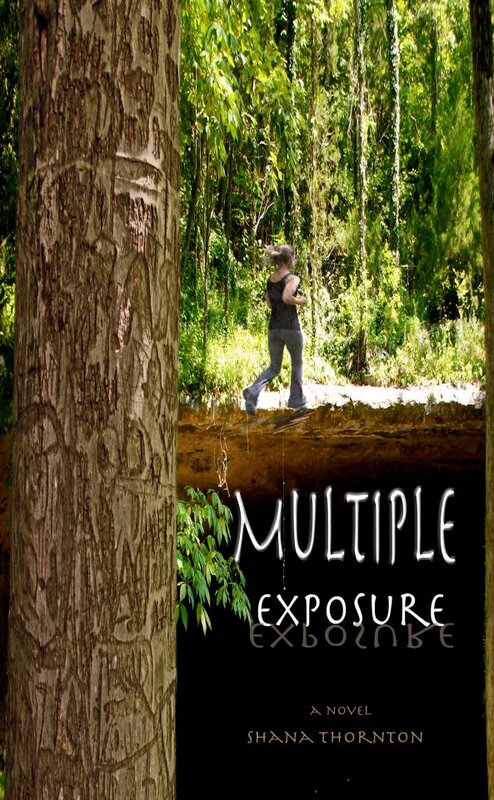 The proof of my novel, Multiple Exposure, arrived in the mail on the Summer Solstice. I hesitated for a single second before opening the box. Waiting for that moment had nothing to do with waiting…I thought quickly, working toward the moment was a better description. Not only have I been imagining, writing, collecting research, editing, learning about the publishing process, revising, formatting, and designing, but I’ve asked for the help of my friends (they’ve even taught me how to take some deep breaths). And, I have gotten by with their help everyday. They are professionals who’ve advised, edited, promoted, and more–the most important gifts I’ve been given in the process of creating a book. I thought about the question for 24 hours. My answer to this question revealed strengths in the book that I hadn’t recognized though they’d played an integral, even critical, role in the novel. The next day I drove an hour to take a series of photos for one of the images on the cover. Many times, a single question crafted changes in the process. Now that the proofing process is reaching an end, I look forward to the next delivery…the box that contains the finished and published books. They’ll be on sale 2 September, 2012, and I’ll keep blogging to keep you informed. I’m planning a book launch party, so more times to celebrate are on the horizon. Ellen Masters’ family has a history—distillers of brandy and owners of the second entrance to Cumberland Cave. In the novel, Multiple Exposure, Ellen tells the story of growing up with one foot rooted in the town’s woodlands, and another as a child of consequences, after events surrounding her father, a Captain in the Army, propel the family to places none of them could have foreseen. Ellen returns to the place of her childhood—a University town and Army post share the same parks and rivers. This is a Southern town populated by a watery, haunted landscape and family histories that become legends. She inherits the Masters’ property connected to the cave, and she begins her own family there, as a professor at the university, with an Army officer husband who is deployed to Iraq and then to Afghanistan. After three students are murdered near her home, Ellen’s fears intensify as she begins to unravel the mysteries of not only that place, but also her mind. In this page-turning novel, Ellen runs from her past, runs toward the unknowable, blindly guessing, and Multiple Exposure represents the individual’s current struggles within today’s virtual social culture. She’s fumbling through online meetings and Skype calls to her husband from a war zone, and all the while, Ellen searches for an explanation to her world and yearns for a connection with her husband and family.